The Carnegie Public Library is continuing a weekly code club this month where kids will learn computer programming skills. Pictured (L to R): Jon Rader, Kentaro Yamazaki, and Slade Blakeley. The Carnegie Public Library is continuing a weekly code club this month. In this informal educational setting, kids will learn computer programming skills through a series of tutorials and projects. They will work toward building websites, video games, phone apps, animations and more, all the while, learning how to become better problem solvers and critical thinkers. The club will be open to all kids ages 8-18 and will meet weekly on Thursdays from 4– 5:30 p.m. Regular participation, while encouraged, is not mandatory. The platform used (Prenda) is self-paced and comprehensive; easily picked up and put down when needed. Families have many demands on their time and it is understandable other schedules and commitments may interfere. While computer space is limited, Leading Edge Technology, a community partner, donates use of a laptop, and any additional computers Coders are able to bring are instrumental to the program’s success. To learn more, please contact Laura Weade at lweade@seolibraries.org or 740-335-2540. While traditionally, libraries have been a place to borrow books and additional materials, they are also a community resource center, offering classes, courses and experiences for people of all ages and interests. Code club fits with that mission. Carnegie Public Library is partnering with technology company, Prenda, to offer its club. Prenda provides software, training and support for libraries around the country to run engaging programming where kids can learn how to code. Learn more at http://prenda.co. The Carnegie Public Library is located in Washington Court House, serving Fayette and all surrounding counties in the southwest area. It provides an array of resources to our community both digitally and physically at its location, 127 S. North St., and through the website, www.cplwcho.org. 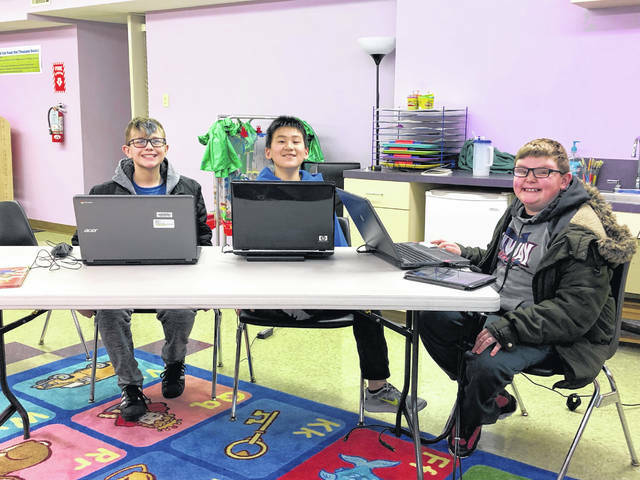 https://www.recordherald.com/wp-content/uploads/sites/27/2019/01/web1_IMG_1258-1.jpgThe Carnegie Public Library is continuing a weekly code club this month where kids will learn computer programming skills. Pictured (L to R): Jon Rader, Kentaro Yamazaki, and Slade Blakeley.